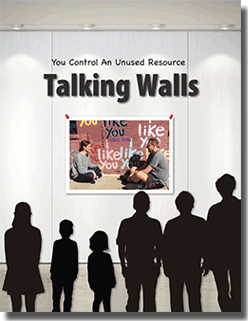 Talking Walls - Give your walls a voice! Give your walls a voice! In a world where everyone is scrambling for attention, especially on the Internet, you control a way to direct-connect with everyone in your building. You control the walls to which you can give voice! Government agencies and private foundations have supported creation of the materials on our website, some of which are in this booklet. Yet, none of it has any value without access to your walls. You can do a lot of good with our free material, as well as manage a better building!